"It would appear as if this Mountain had been torn assunder by some great natural convulsion: on either hand immense masses of granite, pile upon pile, seem as if just arrested in their downward progress. The north-eastern side has of late years been planted, but as you advance, the scene becomes gradually more sterile, and the mountain sides seem actually to threaten an avalanche of granite; and occasionally, in the winter season or after heavy rains, some of the loosened crags are precipitated to the bottom of the ravine, and completely choke up the road, from whence they are removed with considerable difficulty and a vast amount of labour. Though limited in extent, the Scalp is very striking, and cannot fail to excite a train of thoughts leading to the consideration of the successive changes that have taken place on the earth's surface - to the cause that rent the rocks asunder, and threw the shivered fragments so thickly around. In addition to this remarkable feature, the view of the adjacent mountain and high intervening country, as beautifully seen through the vista formed by the dissevered sides of this singular pass, is very interesting. 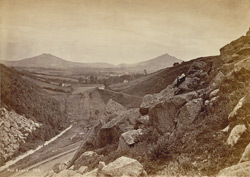 In front are the great and lesser Sugar Loaf, two mountains known of old by an Irish name signifying the Silver Spears, in allusion to their peaked form and the white and silvery appearance of their barren summits; to the left is the rugged outline of Bray Head; on the extreme left is Shankill, a picturesque mountain, better known to neighbouring country people by the name Carrigallagher."